gen:LOCK, the latest anime-inspired, 3D animated series from Rooster Teeth Animation, begins innocently enough with that most mundane, nerve-wracking of human dramas: a young man bringing his partner home to meet the family. Not the type of scene you’d expect from the opening of a sci-fi action mecha series, though it’s not long before the uncanny weirdness of the genre peeks in. Between hydraulic arms hanging up kitchen utensils and the kid sister live-streaming a pop idol performance to a cheering crowd of holographic fans, there’s only one thing that sticks out of this scene as odd: Just why exactly aren’t these two lovebirds eating dinner? Julian Chase (Michael B. Jordan) and Miranda Worth (Dakota Fanning) are members of Vanguard, the military arm of Polity, an ostensibly egalitarian government engaged in a shadow war with a mysterious seditionist faction called the Union in the year 2068. Chase is one of the force’s ace fighter jet pilots, while Miranda is the operator of one of Vanguard’s bipedal artillery tanks, which means, no time for home leave. Instead, the two opt to holographically project themselves to his mother’s house for some much overdue “face to face” time. It’s just as good as the real thing, isn’t it? 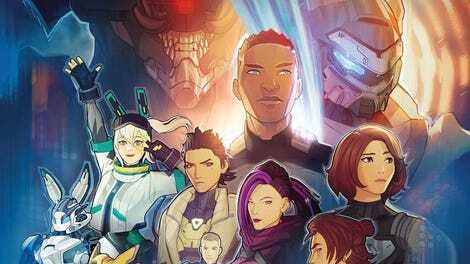 Rooster Teeth’s second in-house animated series following the Monty Oum-helmed RWBY, gen:LOCK fits comfortably alongside its mecha-action ilk. It comes across as a Mobile Suit Gundam by way of Avatar genre send-ups, with more than a passing resemblance to Guillermo del Toro’s Pacific Rim. For the most part, the animation is impressive and well-framed, barring a few off-timed gestures and awkward pauses, and the fight scenes are engrossing with an almost Wuxia-like ebb and flow not unlike a Final Fantasy cut scene. Besides the conventions typically afforded the mecha-action genre, gen:LOCK probes at themes of much deeper, palpable resonance—of isolation and loss, trauma and heartbreak, and the frustrations that come with technologically mediated relationships. No matter the OS version, there are just some things that “face time” can’t fix. Fast-forward to 2072. The Union now occupies the entire east coast of North America. Chase has been killed in one of the war’s early skirmishes. Miranda, in the wake of his death, has become far more cynical and detached, scarred both physically and emotionally in the years since. That is, until the day that one of Polity’s chief scientists, Dr. Rufus Weller—voiced to perfection by Doctor Who’s David Tennant, with his droll, awkward wit and unflappable matter-of-factness—shows up at Vanguard’s doorstep with a surprise announcement. Chase is alive. Well, sort of. It turns out he’s the latest subject in Vanguard’s experimental “gen:LOCK” initiative, a program designed to create 40-foot cybernetic mechs code-named “Holons,” piloted by telepathically sympathetic minds conditioned for combat. Minds like Chase’s. The cost however, in Chase’s case, is tremendous—all that remains of his body is his upper torso, suspended in a saline pod and wired into the base’s systems. In lieu of physical movement, Chase must holographically project himself via the base’s mainframe, which is how he meets Miranda again for the first time in over four years. Things go about as well as you’d expect. Fanning delivers a nuanced, heart-wrenching performance as Miranda, who, upon seeing her dead lover face-to-face again, is wracked with shock, horror, disappointment, and betrayal at him for never having reached out in all this time. Chase, to Jordan’s credit, is both charismatic and sympathetic in their first encounter since his death. Technology may have afforded Chase a second chance to be in her life, but it can’t compensate for the chasms of pain and mistrust that time, secrecy, and Chase’s incorporeality have rent between them. Aside from the show’s flirtations with body horror, gen:LOCK’s dialogue, courtesy of writer-director Gray G. Haddock and Rise Of The Black Panther’s Evan Narcisse, is sharp and engaging, made all the more so by gen:LOCK’s seasoned cast. Jordan’s candor and affect comes through his portrayal of Chase as a deeply likable protagonist, as does Fanning’s in her turn as Miranda, forming the crux of a strong relational dynamic in which the audience can invest. Game Of Thrones’ Maisie Williams shines as the foul-mouthed hacker wunderkind Cammie MacCloud, as does Orange Is The New Black’s Asia Kate Dillon as the acerbic, disillusioned recruit “Val” Romanyszyn. Blaine Gibson as the smart-mouthed ranger Sinclair and Golshifteh Farahani as the battle-worn “Yaz” Madrani round out the impeccable vocal roster. But the most delightful performance is that of anime staple Kōichi Yamadera as gen:LOCK recruit Kaz Lida, delivered entirely in Japanese. It’s easily the show’s savviest production choice and a nod to the mecha genre’s steeped roots in Japanese pop culture. For all the gen:LOCK program has given Chase—a new “body,” a new lease on life, a second chance to fight—it’s still not enough to mend the rifts that time, secrecy, and technology have created between him and Miranda. “You’re not even really here!” Miranda cries out during one of the couple’s first exchanges after being reunited. The pain in Chase’s reaction is affective and gutting, not being able to touch, to feel, let alone to even fully be in the presence of the person he cares about the most. It’s a feeling familiar to anyone who’s gone through a particularly messy online spat with a significant other, and a compelling vector for one of the show’s larger arcs. gen:LOCK is a show with a big heart, a show about what it means to give a damn and do the right thing in a time when heartlessness and apathy would compel one to do otherwise. At its best, it’s a show about how, despite the best intentions of technological design, there’s just no substitute when it comes to some real face-to-face time.